WASHINGTON - The conviction of three Al Jazeera journalists in Egypt to lengthy prison sentences has drawn widespread international condemnation. 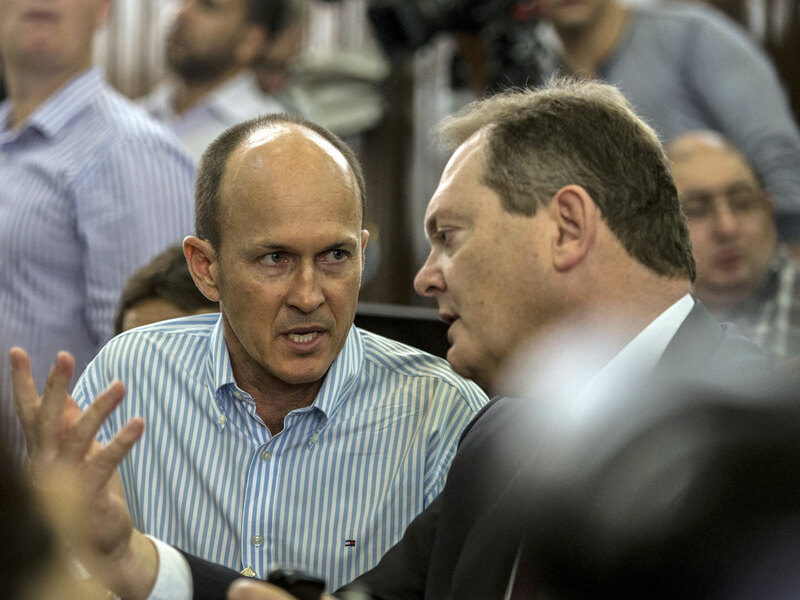 An Egyptian court on Monday convicted Australian correspondent Peter Greste, Canadian-Egyptian acting Cairo bureau chief Mohammed Fahmy, and Egyptian producer Baher Mohammed, sentencing sentenced them to seven years in prison each on terrorism-related charges. Baher Mohammed also received an extra three years in prison on separate charges. The judge also handed 10-year sentences to two British journalists and a Dutch journalist who were not in Egypt and being tried in absentia. Two defendants among 14 others on trial in the case were acquitted, including the son of Mohammed el-Beltagy, a senior figure in the Muslim Brotherhood. The White House strongly condemned Egypt's prosecution of the journalists on Monday, and called for their release. White House spokesman Josh Earnest said the journalist prosecutions were all the more disturbing because they come after a succession of prosecutions that are, quote, "incompatible with the basic precepts of human rights and democratic governance." "We are shocked, utterly shocked by this verdict," Australian Foreign Minister Julia Bishop told journalists in Canberra. "This verdict is hardly sending the message to the international community that Egypt is fulfilling (the) transition to democracy." She said Australia would contact el-Sissi and ask him to intervene. Before the verdicts, Australian Prime Minister Tony Abbott said Monday he spoke with el-Sissi, told him that Greste was innocent and urged him to help. Britain's Foreign Secretary, William Hague, said he was "appalled" by the verdict. The Foreign Office summoned Egypt's ambassador in London to express its concerns. Journalists on trial in Egypt call charges "outrageous" and evidence "flimsy"
The journalists have been detained since December. They contend they are being prosecuted simply for doing their jobs as journalists, covering Islamist protests against last year's ouster of President Mohammed Morsi. Egypt has rejected foreign criticism of its judicial system and on Monday called it interference in its affairs, Reuters reports. "The Egyptian foreign ministry strongly rejects any comment from a foreign party that casts doubt on the independence of the Egyptian judiciary and the justice of its verdicts," the foreign ministry said in a statement. In a statement released Monday, Al-Jazeera said the verdict "defies logic, sense, and any semblance of justice," and vowed to"continue with resolve until Peter, Baher and Mohammed are free." The network insisted there was "not a shred of evidence" against its journalists. Greste, Fahmy and Mohammed were arrested in December in a raid on the Cairo hotel room they were using as an office, as part of a sweeping crackdown on Islamist supporters of ousted President Mohammed Morsi. They were accused of supporting Morsi's Muslim Brotherhood, which the authorities have declared a terrorist organization. They also face charges of fabricating footage to undermine Egypt's national security and make it appear the country was facing civil war. The prosecution accused the journalists of fabricating news reports in support of the Brotherhood -- with pro-government media even labeling the team as the "Marriott Cell" after the central Cairo hotel where they were arrested. In a written statement issued after the verdict and sentences were announced, the Public Prosecutor's office said the men had been convicted of creating recordings and other matieral "to be shown to others and presented before the public in Egypt and abroad, with the aim of giving the impression to foreign public opinion that Egypt is undergoing a civil war, in order to weaken the state and its standing, harm the national interests of the country, agitate public security, spread terror among the people, and damage public interests." CBS News' Alex Ortiz explained, however, that the prosecution offered little real evidence to back up those charges. They paraded pieces of equipment commonly used by broadcast journalists, such as cameras and tripods, in front of the court as if they were bloodied murder weapons.